Life always offers you with thousands of choices, and what you have to do is taking one. The same is true when it comes to choosing a smart phone from the variety. From the perspective of a consumer, I would prefer Apple's new generation - iPhone 8, since the baking-hot iPhone 8 comes with a 5.8 inch OLED display at 2800 x 1242 resolution (521PPI) to support watch HD widescreen movies. Hence, no doubt that iPhone 8 will bring the Apple junkies a more enjoyable HD video experience. Having said that, I still rake up the old saying: Nothing is perfect! You see, when I sync HD MKV to iPhone 8/Plus for playback, I instantly fizzle out as iPhone 8 abides by the Apple tradition, only compatible with MP4, MOV, M4V file formats. The other HD MKV, MTS, AVCHD, AVI, FLV files wouldn't be accepted unless they can be converted to iPhone 8 friendly formats. Thus, a best-in-class iPhone 8 video converter is a crying need. 1. Support All Video Audio Formats: convert not only HD MKV, MTS, AVCHD to iPhone 8, but also the standard video like FLV, 3GP, WMV, AVI to iPhone 8. 2. High Quality: crisp yet sharp image and clear sound. 3. Fast Speed: Transfer MKV to iPhone 8 within seconds at full speed. 4. Multiple Features: free download YouTube to iPhone 8 for offline watching. Grounded on the above standards, many inferior video converters for iPhone have automatically quitted from the battle for top. 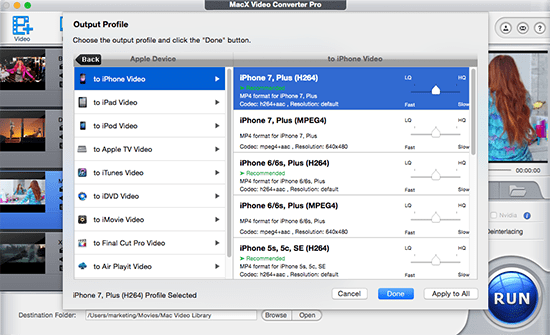 The rest are elites, top among them goes to MacX Video Converter Pro, which is able to convert MKV video to iPhone 8 as well as MTS, AVCHD, FLV, AVI, HEVC x265 to iPhone 8/Plus, iPhone X/7/6s/6/Plus on macOS Mojave or PC (Windows 10) with intact quality. More importantly, the whole process will be finished with the world's fastest speed, up to 5x faster than others thanks to its powerful its first use of Intel's QSV/Nvidia/AMD GPU hardware acceleration tech. It outshines its rivals also at its capability to faultlessly download and convert HD YouTube to iPhone 8 within barely 4 clicks, even 4K ultra HD YouTube no object. In consequence, you can enjoy the funny YouTube videos or music videos on your iPhone 8/Plus without worrying about network connection any more. Step 1: Load HD MKV file. After free downloading video converter for iPhone, or get the Windows version run it. Click "Add File" button to load the MKV file you want to convert to iPhone 8. This top video processing software can also support to convert HD video to the new iPhone at batch. You can choose different formats for different files. Here we choose MP4 as output format from the format list. You can also choose to transfer MKV to iPhone 8 supported formats like converting video to H.264, MOV, etc. for playback or uploading. Tips: it also leaves the initiative to you to convert HD MKV, MTS, AVCHD, AVI, FLV to iPhone 8 with the specific parameters offered to adjust, including Bit rate, Frame Rate, resolution, etc. Step 4: Start Converting MKV Video to iPhone 8 on Mac. Click on the "RUN" button and this smart iPhone 8 video converter will begin to transcode high definition MKV to iPhone 8 MP4 format in a few minutes. Then you can enjoy high definition video on your iPhone 8/8 Plus for watching anywhere anytime. Step 1: Download YouTube HD Video on Mac. Free download and launch this YouTube to iPhone converter, then hit the "YouTube" button and copy & paste the YouTube video URL to the address bar. Click "Download Now" to finish the HD YouTube video downloading job. Step 2: Convert HD YouTube Video to Any Format. After finishing YouTube HD video downloading, the downloaded one will be automatically added to the convert list. You're free to choose convert YouTube to MP4, MOV, etc. iPhone 8 tolerable format. Click "RUN" button to begin YouTube HD to iPhone conversion process. Tips: Want to do more interesting things with this video converter app for iPhone 8/Plus? Hold on! This best all-in-one video converter for iPhone 8 also empowers you to convert HD MKV to iPad mini (Retina), iPad Air, iPhone Xs/X/8/7/6s/6/SE/5s, Galaxy S8/Note 8, Surface Pro 4, etc. easy as can be. Better still, no difficulty amounts to much for you to record on-screen videos, edit video with this world-renowned video transcoder in hand. So if you are looking for the ideal all-round video converter, give it a spin!